Shipping included with tracking. Call 443-740-4240 or email Anderson@WildRoseAlpacas.com for combined shipping rates when ordering multiple items. 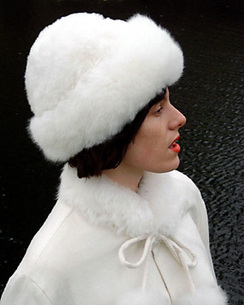 Elegant, luxurious hat made of 100% Baby Alpaca Fur with satin lining. Stylish and incredibly warm. Unbelievable softness to the touch. Each hat is made by hand and is unique. Be the envy of the fashionistas!